Kumu Poni Kamauu chanted yesterday while leading the memorial Procession of Mamakakaua in honor of King Kamehameha the Great's birthday. 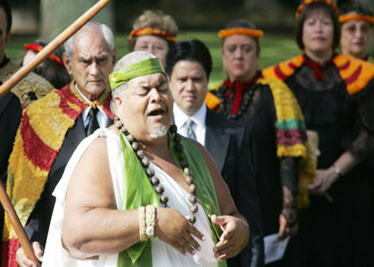 The event was held in front of King Kamehameha's statue and featured songs, chants and prayers. Mamakakaua, also called the Daughters and Sons of the Hawaiian Warriors, has stood watch since 1921 to honor the king's birthday.